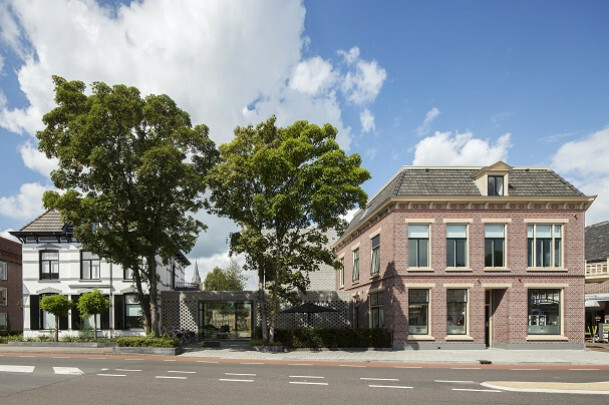 The house where Piet Mondrian lived from his eighth to his twentieth year and the neighbouring house have been converted into a museum that focuses on the early years of De Stijl’s most important painter. (Mondrian’s father had become headmaster of the Christian primary school in Winterswijk.) The collection contains a number of early works by Mondrian and is regularly added to with permanent loans from the depot of Haags Gemeentemuseum, with which the Winterswijk museum has a working relationship. This early work is housed in the new two-storey brick block between the two buildings. The former neighbouring house is devoted to the biography and life of the painter and his family. The glazed passage connecting the villa and the exhibition areas and giving a view of the garden has a perforated brick screen that filters the incoming light. Inside the new block, the timber floors and stair have been painted in a design by the visual artist Jan van der Ploeg (1959).